Rome January 4, 2015 · 16 min. readThis article may contain affiliate links. 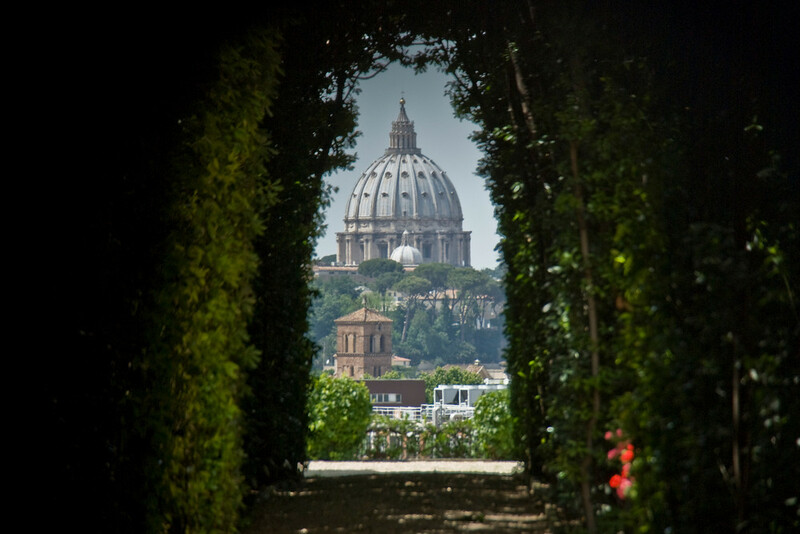 There is no simple way to describe Rome. Perhaps saying it's the world's greatest metropolitan museum is a start. Maybe calling it the City That Made History would be better or maybe even The City of the Gods. Rome is massive; modern and ancient at the same time. You can take the state-of-the-art subway system -- far superior to that of London's -- to 3,000 year-old statues, structures and relics in a flash. To say Rome is "just" Vatican City, or it's "just" the Coliseum is a vast understatement. 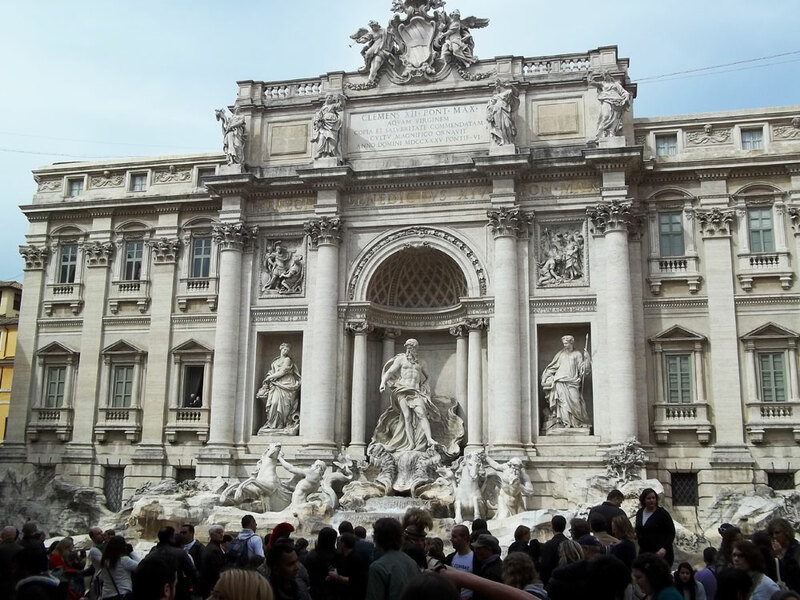 The history, the power, the determination, the poverty, the intentions, the battles, the heroes, the gods, the beginnings of Christendom, the destruction of the city, and even history itself was stitched into the very streets of Rome. Rome is indescribable. It isn't as beautiful as Venice, but the energy and feel of Rome was just indescribable. We began the day by taking the coach to the subway system. Flip told us how to read the subway maps and how to get back to the area near our hotel during the day if we wanted to. We were then given an all-day free subway pass and we were told to use it as much as possible. 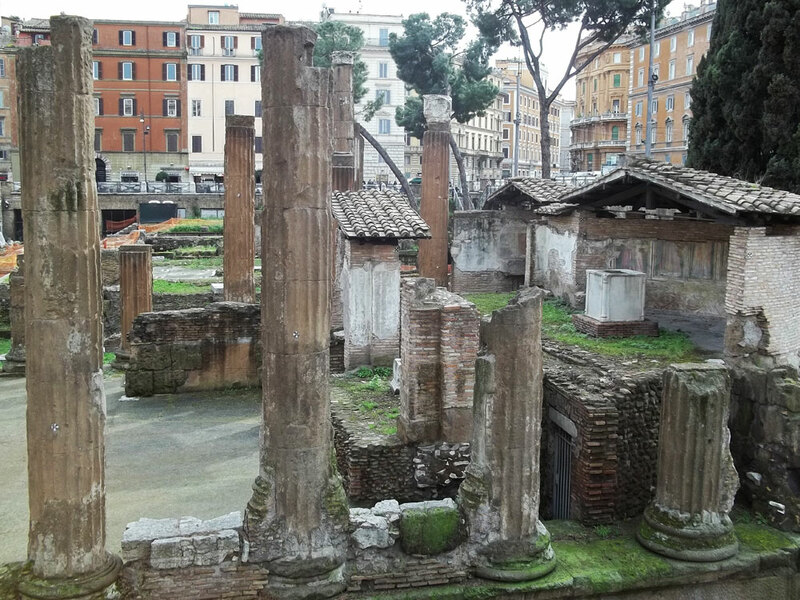 We took the train to Termini, changed trains and took it to Collesseo -- the train station right across the street from the Coliseum, and a massive excavation site that has been going on for over 200 years. We had a half hour to explore the area before our tour of the Coliseum began. I walked down the street to find a massive wall with 4 pictures on it. Each of the 4 pictures showed different sizes of the Roman Empire at different times, which was very interesting to see. Flip said that there used to be 5 pictures, not 4, and that the 5th one was a gift from Adolf Hitler to Benito Mussolini. That picture was a picture of the whole world (not just Europe) and showed it completely covered -- meaning that with the alliance between Germany and Italy, the Roman Empire would eventually take over the world. For obvious reasons, this picture was removed after the war. I joined the tour of the Coliseum and, once we got inside, a tour member asked why all the walls had so many holes in them. By "holes", the member was referring to the actual head-sized holes in the actual structure. 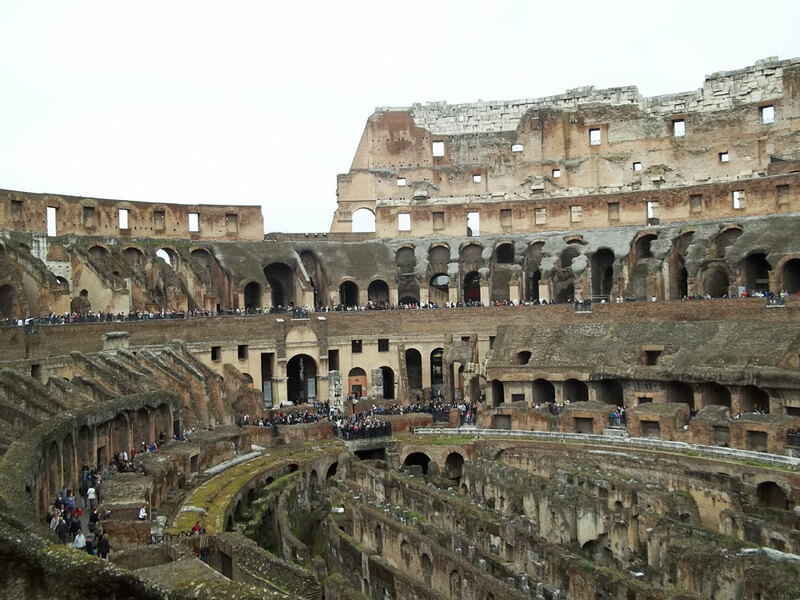 The tour guide said that when they built the Coliseum thousands of years ago, they used limestone instead of normal stone or marble, and as a result, they couldn't use normal mortar. Instead, they used bronze nails to keep it together. After the barbarians sacked Rome, the Roman Empire crumbled and the population of Rome dropped from 1,000,000 to 10,000. This was when the Middle Ages had begun. To create armour and shields in that time, the people of Rome went to the Coliseum and melted down the 130-foot hight statue of Colossus outside it. After that was gone, they needed more bronze so they dug it all out of the walls and those are the strange holes in the walls today. Our tour continued deeper into the old building. We learned of the hand gesture the emperor would make during the Coliseum games to determine the fate of the fallen gladiator (who were named after the short-sword called the gladiate -- which they used in battle). 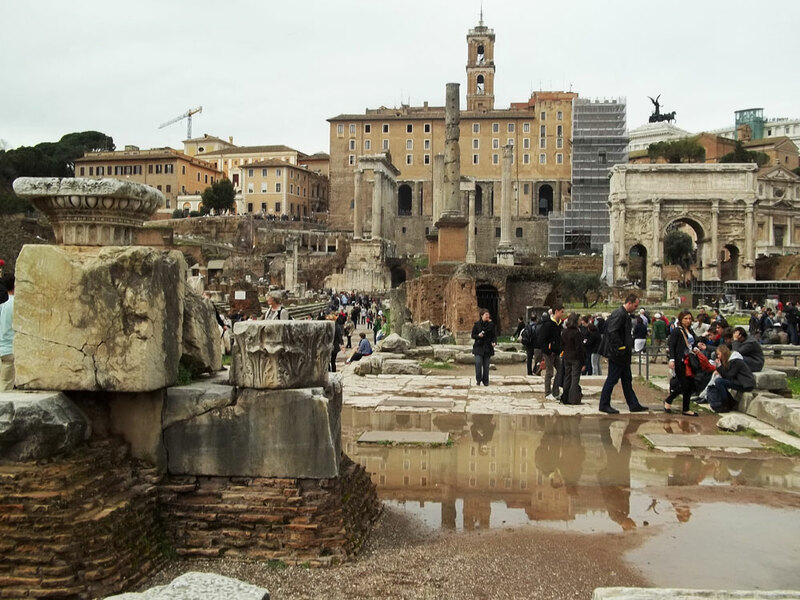 We were also told that a long time ago, the Romans had tried to flood the Coliseum with water for a mock-ship battle, but it didn't work out as planned and they never did it again. Instead, they put trap-doors in the floor of the Coliseum to let wild animals and warriors enter the arena. That floor has long been destroyed and now the ancient caverns and tunnels that were built underneath it can easily be seen. Also, we learned that there used to be a cloth covering over the building that was controlled by specially trained sailors. I believe the covering was there to keep rain from coming in, but the tour guide never said. After a few pictures, we headed out of the Coliseum and into a park behind it to go see, pretty much, a pile of rocks (officially called the Roman Forum). 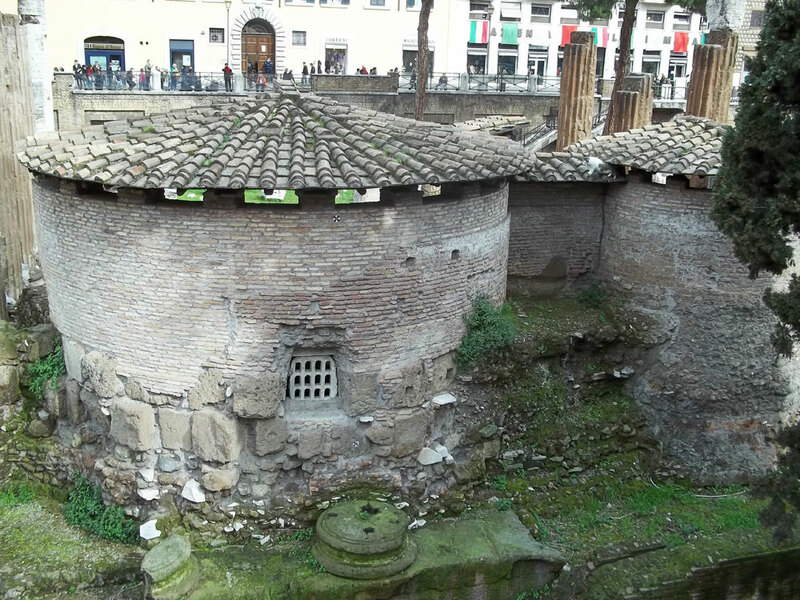 This "pile of rocks", however, were the ancient houses, temples, stores and streets of Ancient Rome. 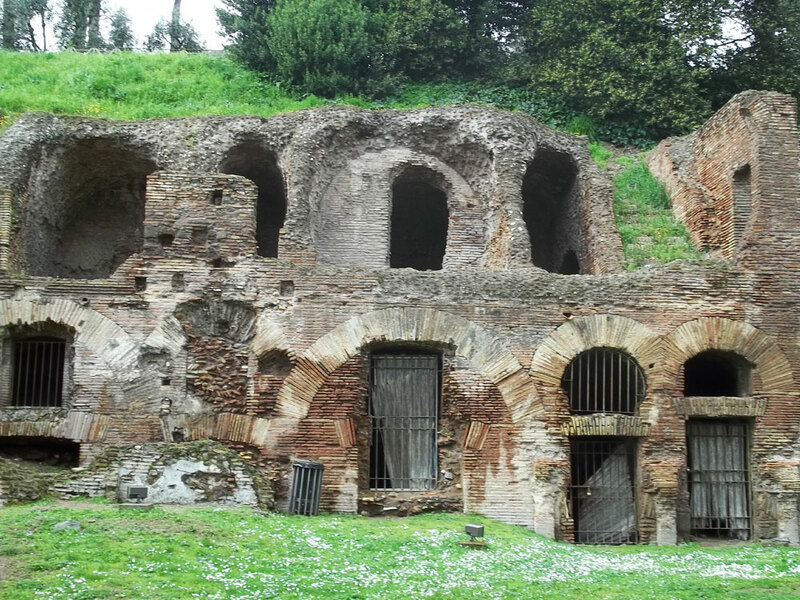 It lies right between two of the Seven Hills of Rome and used to be a major super-market, always full of fresh fruit and vegetables, farmers, beggars and plenty of gossip. Once Rome fell however, these houses were abandoned and the streets deserted, and in time over 500 years of sediment filled the area. Right before the tour ended, our guide showed us the sight of were a demi-god was buried. That's right; I got to see the tomb of Julius Caesar, the most powerful leader in the history of the world. He lay in his own mossy tomb under a mound of dirt, where fresh flowers were placed daily. Nothing is more amazing or incredible than to see the final resting place of a man who is known in the Europe, Africa, Asia, the Americas and Oceania for his rule. Caesar's bones were mere feet from me, and it still makes me shiver! After that, our tour ended and Flip met up with us again. We followed her to Forma di Trevi and had free gelato -- which is basically ice-cream. The fountain was gorgeous, but I was too busy getting gelato (and watching a pigeon fly and steal one of our tour member's cone) to hear the history of the fountain and its existence. Sorry. From then on, we had free-time. I decided to go north first, to Piazza di Spagna and climbed the Spanish Steps. At the top, I took brilliant photos of the city and went inside Trinità dei Monti, which, like all churches in Europe, was beautiful. I then left the church and saw that the rooftops around the Steps had been converted into a massive, unique restaurant! I took a few pictures of this too, of course. I headed south-west, and after a brief fit of confusion, I got to the Pantheon. Today it was open and I got to take pictures inside. Unfortunately, I wasn't there at 12 and I didn't see when the sun shines directly through the hole in the roof and illuminates the whole temple brilliantly. 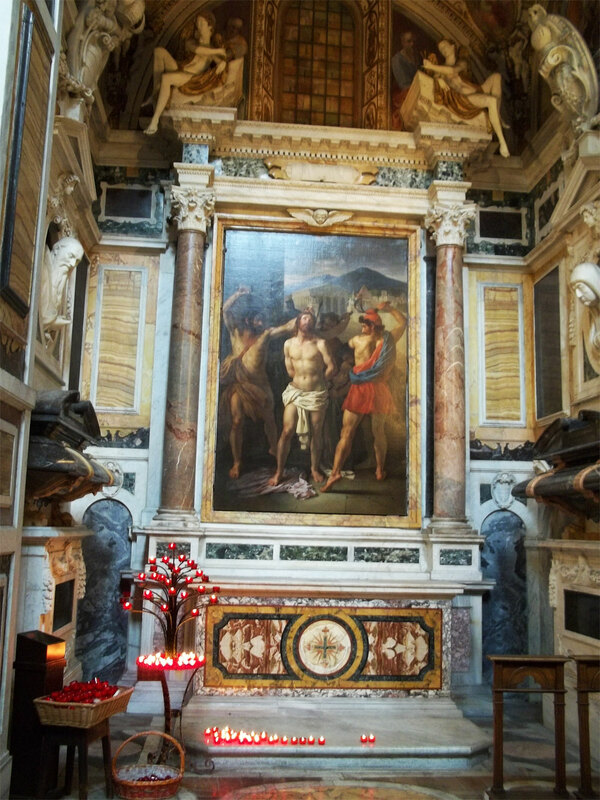 As one wise man once said, "There are a million things wrong with St. Peter's Cathedral, but not even one wrong with the Pantheon". I recommend going there! 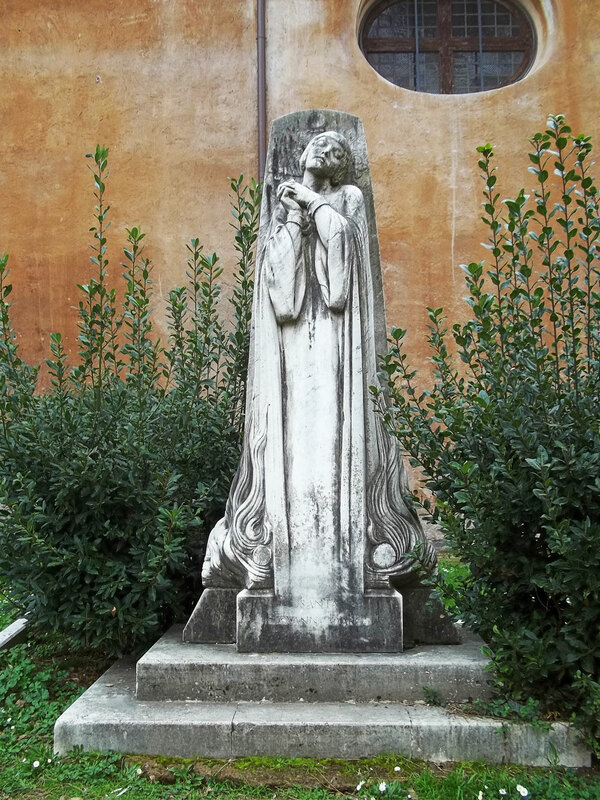 I then walked south a bit and crossed the Tiber to the Santa Maria Cosmedin, which is the home to the Mouth of Truth. The Mouth of Truth is a massive statue that will bite the hand off of anybody who dares to put their hand in its mouth and lie. Flip told us a story previously about the Mouth. She said that a long time ago, a Roman woman had committed adultery against her husband. Her husband found out, and wanted to believe she was innocent, but wanted the Mouth to declare if she was or wasn't. Many people watched the couple walk to the Mouth, and when they were a block or so away, a crazy man jumped out of the crowd, ran up the wife, kissed her and then ran away. When they reached the Mouth, the woman put her hand in the Mouth and said that the only man she's ever kissed was her husband and the man who kissed her on the way there. It turns out that the man who kissed her was also the man she had cheated on earlier, and the Mouth was so mad at being tricked that it stopped working. I walked around the area for a while and was sadly unable to find the Mouth, so I carried on south. I began winding down Italian side-streets and found many beautiful parks. I also saw an Italian army-jeep and several Italian army-persons brandishing their machine guns, so I made sure I was on my best behavior. Although I was told their uniforms were fashioned by Gucci, I still thought they looked rather boring. I walked back to Santa Maria Cosmedin and saw a few members of my tour group outside of a building. I joined them and asked why they were in line. They told me that the Mouth of Truth was inside the building, not outside! I got in line right behind them and we were less than ten feet from the gates when the door closed for 5 PM. I checked my watch and it was only 4:50. I felt so frustrated and so dumb! If only I had realized it was inside the church earlier, I could've got a picture with my hand in its mouth! I joined the group of four people and we went to a fancy Italian restaurant. I had carbonara, as did everybody else in my group except for Kristi, who had fettuccine alfredo. Carbonara is a spagetti covered with a cheese/egg mixture and has pieces of ham in it, in case you aren't familiar with Italian pasta. It was delicious, especially with parmesan cheese sprinkled on it. By the time we were done eating, the sun had gone down and we headed to Barbini subway station an hour earlier than we were supposed to. The group wanted to go back to the hotel, but I wasn't done in Rome yet so I segregated and decided to go home with the main group later. The main group, however, never showed up (I had gone to the wrong meeting station), and I had to take the train all by myself. It took me a long time to realize what had gone wrong. I took the train to all the stations we were told to meet at, but I never saw anybody I recognized. I finally got back to the main station were had got back to the station our day had started with, but the bus we were supposed to catch wasn't there! I had to find my way to the hotel all by myself! I remembered that Flip said the number 21 and 201 bus took us to our hotel from the station, but I didn't have enough money for the bus. So, instead I followed the bus. I followed them from stop to stop, waiting ten minutes for a new one to come along if I lost track of a previous one. Finally I found Moe's Pub -- the pub Muffin and the gang had gone to last night. However, I didn't know how to get from the Pub to our hotel. I wandered between the Pub in La Giustiniana and the city entrance to Rome for over two hours trying to find the hotel! Finally, after 3 hours after I had taken the train at Barbini, I managed to find the hotel and get into my room, safe, sound, sleepy and exhausted. So on that note, goodnight Journal. Rome was amazing. I doubt anything else on this tour across Europe can top it! PS: I found a street merchant in Rome that was selling 20 postcards for €1. I thought they would be junk, but I bought it anyway. Was I ever surprised! The postcards in that pack are better than the ones I got at the Vatican -- which cost me €3 for 6! What a great deal!